The Cherry Red Shrimp is also known as Red Cherry Shrimp (RCS) or Cherry Shrimp. Also comes in other colour variations like the Yellow Shrimp. A very similar looking shrimp, Neocaridina zhangjiajiensis, also comes in colour variations called the Snowball Shrimp, and Blue Pearl Shrimp. A relatively new variation on the Cherry is now becoming more readily available, or Neocaridina heteropoda sp. (Sakura), aka Sakura Shrimp. They are basically a very bright solid red compared to the more speckled/striped Cherry Shrimp. Females have a deep red colour and have a more curved underbelly. Males usually are smaller and more translucent whilst also have a more slender abdomen than females. Do not stock with anything that can fit the entire shrimp in its mouth. Best kept in a shrimp-only tank if breeding success is desired, as there are very few fish that will not eat newly hatched shrimplets. Compatible fishes that will not eat shrimp are Otocinclus. Eats mostly algae, however will eat carrion and prepared fish food. Is more accurately described as an opportunistic omnivore/detrivore, meaning that it will eat most any organic matter it can find. 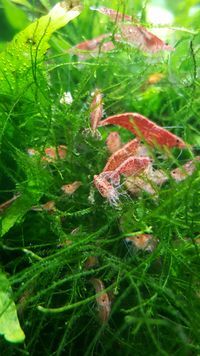 Some say it's a better algae eater than the Yamato or Amano shrimp - Caridina japonica Shrimp will also eat microfauna that grows on the plants and glass of the aquarium, providing a wider variety of vitamins they need. If there is a light on the tank for long periods, say 10+ hours per day, the shrimp do not need to be fed at all as they graze on microfauna (infusoria). When they are starving they will eventually eat some softer types of algae. German research indicates feeding high protein foods leads to premature shedding of their carapace and shortens their lives. Planted aquariums will be beneficial to the health of these shrimp. A heavily planted tank will allow them to hide from other fish making them feel safer. When the shrimp feel safe they are more likely to have deep red colouration. Shrimp and all inverts are very sensitive to ELEMENTAL copper. Copper compounds, in low amounts do not hurt them. So the copper sulphate found in almost every fish food, will not harm the shrimp. This shrimp is easy to breed. You just need a male and a female. Keep these shrimps relatively cool at 18-23°C (64.4-73.4°F) and they will breed. Females are larger and much more deeply colourfully red, males are smaller and display a clear carapace colouration with red spots. When the female is mature (after about 3 months) she will often at times display a saddle (an internal mid section area which is light yellow or green in colour). The saddle is the eggs developing in the ovaries. It takes typically 30-45 days from pregnancy to hatching. Provide an amount of Java moss is all that is generally required to make these shrimps feel safe to breed. The female carries the eggs around with her until they hatch.The female has a bigger tail to hold the eggs. These shrimp are very curious. They will visit any new additions to the tank and clean it mercilessly. They will not damage live plants but will clean the algae off them quite readily. Approximately once a month (depending on diet, age and environmental factors, it could be more or less frequent), the shrimp will moult (that is shed its old shell (carapace) to allow a new, slightly larger one to form). During this time, the shrimp will seek out a place to hide while it's new shell hardens, for safety reasons. Many inexperienced aquarists jump to conclusions, assuming their unseen shrimp to have been eaten; these fears are short lived however, as they usually reappear after a few days. The moulting of RCS is interesting. They bend into an upside-down "U" shape, then *pop*, they jump out of their shells. Freshwater shrimps are becoming more popular in the USA and in the UK. Red Cherry Shrimp is commonly found in aquarium stores throughout the US and is easily attainable. Gerd Voss's - German web site (amazing) - Google English translation. Garnelenaquarium - Another interesting German site (Google Translation). This page was last edited on 18 October 2017, at 01:08.